A year ago or so I wrote about George C. Teel who was a career Navy man. Since then I have sifted through many pages of his personnel record from the Archives in St. Louis. He served on many ships, frequently transferred from one to another. All of his deportment ratings were good; he was never at the top of any classes he took, but he always passed with more than adequate grades, frequently his average would be 3.5 out of 4.0. He was always recommended for further classes which allowed him to achieve a higher class rating. He joined the US Navy in 1905 as an Apprentice Seaman at age 17 with his mother’s signature on a consent form. George’s mother, Eliza Teel, died in Ruthven, Iowa, two years after George joined the Navy and before he had finished his apprenticeship. He reenlisted in 1908, Seaman 3rd class, to serve another 4 years. During that time he attended Petty Officer School and was recommended for Electrician 3rd class. This evidently was a field he was comfortable in; he excelled in wiring and repair of same, but did not do well with messaging in wireless telegraphy. During this tour, his rating went from Electrician 3rd class, to Ε 2nd class in 1911, to E 1st class shortly before his discharge in Nov. 1912. At the end of this enlistment, at age 25, he took some time off from the Navy. After 7 years of regimentation, for the first time he had a little money in his pocket and he could explore the world on his own. His travel money upon discharge was from San Diego to Bremerton, WA. He had listed as next of kin Millie Crosby, his aunt, but Millie lived in Sacramento at that time, so I do not know who he went to see in Bremerton. During the next five years he evidently was living some of that time in Montana. When he reenlisted again in 1917, he gave his home address as Sage, Montana, his next of kin: Millie Crosby, Alger, WA. In case of emergency, notify Aletha Barringer, Inverness, Montana. Aletha Barringer came from Ruthven, Iowa, likely someone George grew up with. At one time a Barringer family lived next door to Eliza and George Teel in Ruthven. Obviously he was still single at age 33. In another form, he stipulates that he sends Wilma occasional contributions. Agnes Wilma McCord did not marry until 1926; she lived home with her parents but they were elderly and not well. Wilma’s grandmother, Elizabeth Cramer Sears Quimby was a sister to George’s mother, Eliza Cramer Teel. He reenlisted again in August 1923, giving a home address of Rudyard, Montana. When this enlistment was due to expire, he extended the enlistment for another 2 years, to 1929, for which he received $200 and a leave with travel allowance to Butte, MT. I’m not sure that he went to Butte; travel money was probably allotted from where he enlisted. When I found a Hattie Teel who died in California in 1966, the California Death index gave her maiden name as Menge. It was not hard to trace her with that surname. But I found a treasure trove of vital statistics in a most unexpected place. Hattie Menge applied for a passport in Chicago, her father was Onesimus Menge, b. London, England, deceased, he had resided 1879-1919 in US, naturalized citizen. She had resided outside the US (France) from Nov 1918 to August 1919, her permanent residence, Chicago, IL, and occupation stenographer. Last passport obtained in Cedar Rapids, IA in Sept 1918; intention to leave the US within 5 years for the purpose of missionary work to China, Hong Kong, Japan (Hong Kong had been crossed out) intend to leave from San Francisco on the Korea Maru on April 1, 1922. Oath of allegiance to US signed 16 Mar 1922. “I desire to remain a citizen of the US and will return there on furloughs. I do not pay American income tax. My annual income is less than $1000. I bear passport #188 Chicago series, issued by Dept. of State March 18, 1922 for the purpose of travel, missionary work Japan, China. I have never been married.” Signed Hattie Menge, 8 April 1924. Description: age 35, ht. 5′ 6″, eyes gray, hair br, medium complexion. She arrived back from Shanghai on the Empress of Australia, sailing from Hong Kong Oct. 2, 1925, arriving Vancouver, B.C. Oct. 1925, then Seattle; she was the only passenger. Address in US: Friend, Mr. F.L. Connelly, 5235 Cornelia Ave., Chicago, IL. So how did George and Hattie meet? George C. Teel was probably not someone who would be overly confident. I am basing that on his description, though I could be wrong. He was 5 ft. 4 inches tall, was bowlegged and had deformed front teeth. This data comes from the identification marks written at time of his physical exam. The bowleggedness, often caused by rickets, a familiar sign of poor nutrition as a child, might have passed unmarked by the public, as there is a rumor that many old time sailors were bowlegged from keeping their footing on the ship’s deck at sea. But in 1925, I’m not sure how it would have been accepted. The deformed front teeth certainly would not have improved his smile. His vision, however, was perfect. On Feb 16, 1926 George was transferred to the US Naval Hospital in Canacao, Philippines, from the USS Penguin where he had been assigned since his last reenlistment. He was transferred via the USS Pillsbury and it took 5 days to get him to Canacao from wherever the Penguin had been when the ship’s doctor determined he needed hospitalization. He was at Canacao two months when, not being able to determine the problem, they transferred him on April 19th to the Naval Hospital on Mare Island, San Diego. It took a month before he arrived there (I have visions of this poor man transferring from ship to ship on one of those high wires strung between ships. But that is probably melodramatic and he was transferred by boat – several times.) Once at Mare Island, they quickly diagnosed a duodenal ulcer. He was treated and returned to duty on July 10, 1926. On September 7, 1927 George Teel was transferred once again to US Naval hospital in San Diego, for treatment. He was returned to duty on Nov 10, 1927. However, he was given leave from Nov. 14 – 30, 1927, classified as “annual” leave. Here’s my theory. Hattie was a stenographer. It would not have been hard for her to get a job in San Diego with the Navy. She may have even worked at the Naval hospital. Certainly George would not be the first sailor that found his wife at a military hospital. Anyway, while I cannot find a marriage date for them, the birth of their son, George Douglas Teel on July 13, 1928 works out pretty well to make a guess they married in November 1927. George had already extended his enlistment and when that was up in August 1929, he immediately reenlisted; he was close to his 20 years. He received his permanent appointment as Chief Electrician Mate in March 1930, and transferred to the Naval Reserves in June 1932 with 20 years, 8 months and 20 days of active service. In Nov. 1930 and again in June 1932, Hattie with their son, traveled from California to Honolulu where George was stationed at the submarine base. They may have all come back to California together when his transfer to the Reserves came through in June 1932. The 1940 census shows George living in Los Angeles, with Hattie and their 11 year old son. These two parents who married late in life must have felt fortunate that they could have a child. Hattie was 40 when their son was born. George was working as a sub station manager for City Light and Power Co. Their son was in school. But there was not to be a “happy ever after”. For some reason not yet known, their son, George Douglas Teel, died in January 1945, only 16 years old. I have sent for his death certificate but it will be several months before it comes. On July 1, 1939, having completed 30 years of service to the Navy, George was transferred from the Naval Reserves to the Retired list, Chief Electrician Mate, to receive the appropriate pay and benefits for his rating. Then there is this: “The Secretary of Navy is authorized in times of war or when a National emergency exists to call any enlisted man on the retired list into active service for such duty as he may be able to perform”. George Teel was recalled to active duty Feb. 19, 1942 and was sent to the Naval Training Station in Newport, R.I. for duty as instructor in the Service Schools there. Later that year he was transferred back to San Pedro, CA and he served until his release from active duty on August 1, 1945. On a beneficiary slip made out April 1, 1945, he lists his wife Hattie Teel, and full name of child: George Douglas Teel. Hattie died in 1966 and George Cramer Teel moved to Florida to live with Mr. and Mrs. Harry Stalker, Mrs. Stalker allegedly George’s sister. I still do not know how she fits in. But I have a clearer picture of George Teel now. The Navy afforded him a way out of a precarious existence as a youth and he made a life for himself. His mother would be proud of him. I was stunned. I just sat there and stared at my computer screen. There was no shout of victory, no dancing around, no celebrating as has happened when I have found other information after a years-long search. I could hardly believe my eyes. There it was: “Pillar Point, NY”. James Nelson Douglass, born Pillar Point, New York. I, myself, was born on Pillar Point, a small scrap of land reaching out into Guffins Bay in Jefferson County, NY. But I have rarely, if ever, seen Pillar Point noted as a birthplace. Usually the records will say Jefferson County, NY or more likely, Town of Brownville. As has happened before, my very best genealogy discoveries have occurred when I was looking for something else. I research the families of nine Douglass siblings, sons and daughters of my fourth great grandfather. I am descended from the second oldest of the nine, James Douglass, who homesteaded on Pillar Point. He had three brothers who also lived there. But Giles was the only one I have been unable to trace. I was searching records on the internet for Cook County, Illinois for James E. Douglass when I came across a death record for “James Nelson Douglass, father Giles T. Douglass, mother Folsome”. That brought me up short. I had never seen Giles Douglass with a middle initial T. but, more important, was the Folsome, because on a small scrap of paper in the old Douglass file handed down to me by my late uncle, was written in pencil: “Giles Douglass married a Folsom?”. No dates, just a few names. My search for James E. Douglass was immediately suspended. I had a new clue for Giles. I knew that in 1847 Giles sold his land on Pillar Point to his brother, James, and moved to Wisconsin. There the trail ended. I have searched the records many times; I have been to Wisconsin myself. I have tracked down every clue that I have seen and found no record that Giles Douglass was living after 1850. In 1850 Giles and his son, Robert, were living in Racine county, west of Milwaukee, with the Moody family, who were also transplants from New York state. I have not found Giles or Robert in any census after that. Now, suddenly I had stumbled on a possible son of Giles Douglass. It had to be! Pillar Point is not that big a place. The record had no first name listed for his mother but I was pretty sure I knew her first name. When Giles sold his farm to James, the land record clearly shows the signature of Pamelia Douglass. So all I had to do was find a Pamelia Folsom, right? Well, now we are getting back to around 1800. Women did not often appear in records; their husbands, or fathers or brothers, owned everything. In fact, I had been surprised to find Pamelia’s name on the land sale record. That’s why the Folsom was like a red flag. Look! Douglass and Folsom. Ancestry.com had indexed the Illinois death records. James Nelson Douglass died in Rockton, Illinois. It made sense when I looked at the map and realized Rockton, Illinois, is only a few miles south of the border with Wisconsin and only about 20 miles from Janesville, Wisconsin, where I had chased down a newspaper clue back in 2009. Checking the census records for James Nelson Douglass, the first I found for him was in Rockton, Illinois, in 1860. At that time he was 25, a laborer, owned a little real estate ($200 worth), was married to Charlotte who came from England, and they had no children. In the next census, ten years later in 1870, at age 36, James owned real estate of $1025, was “working in furnace” (possibly that translates to a foundry) and they had one daughter, Clara, age 3. In 1880 the census reported James N. Douglass was a sexton, with wife Charlotte and daughter, Clara, 13. The 1900 census, twenty years later, showed James N. Douglass was still a sexton; the couple had been married 45 years and Charlotte reported she had born three children and only one was still living. In the 1910 census, James N. Douglass, 76, widowed, was living with his son-in-law and daughter, Frank and Clara Graves, in Rockton, Illinois. Any hope of finding a descendant of Frank and Clara ended when it appeared the couple had no children. The middle name Nelson was interesting. I was unaware of any Nelson Douglass in our extended family. Then I found an obituary for Ezra Folsom (1842-1931) in the Watertown Daily Times. It said he was born on Pillar Point and was the son of Nelson and Polly Folsom. Pamelia Folsom would have been born much earlier, around 1801-1805 probably, so Ezra is not likely her brother, but the Nelson name came from the Folsom side of the family. And now, finally, I can be fairly sure that Pamelia’s last name was Folsom, and that pencilled note in the Douglass file was right on. The only other names on that scrap of paper were possible children: Rhoda, John and Robert. Robert was in Wisconsin in 1850 and he received a land grant, but evidently sold it. He may have moved further west. I have never found Rhoda or John, at least not yet. About ten years ago I was contacted by Bruce, a man whose great grandmother was Mary Emily Douglass. She married a Seaton in Wisconsin and Bruce believed that Mary Emily was a daughter of Giles Douglass because in the 1850 census, the last one Giles was ever found in, there were several Douglass children scattered in the area, each living with a family of a different surname. The theory was that Giles’ wife had died and the children had been “farmed out”, lent to farm families to help with chores in exchange for their keep. I could not endorse that theory at the time because I had no knowledge that Giles had more than the three children whose names were on that scrap of paper and who appeared as unnamed children in Giles’ household on the 1830 census. But when I accessed the 1840 census on Ancestry, which had been unavailable in Jefferson County archives, it suggested there might have been more children. And Mary Emily’s birthday would fall into the 1830-1840 range. So it is quite possible that I not only have found a son of Giles’ but there is a daughter, Mary Emily, as well. Time will tell if this holds up under further scrutiny. While I have many names (over 5000) on my Douglass family tree, I have not had a Eunice either born into or married into the family… until now. I have written before about Earl Douglass of Chaumont, NY. His small claim to fame was that he was sought out by the U.S. Fisheries Commissioner for information about fishing along the shores of Jefferson County, NY; he was recognized by the locals as an expert on the subject. After 30 years of fishing in Lake Ontario, Earl had left Chaumont and was fishing near Sault Ste. Marie which is where the Commissioner went to interview him. This interview appears in the 1900 report of the Bureau of Fisheries at Washington. There are three Earl Douglasses on our tree. Do not confuse this Earl with the one who discovered the Dinosaur remains in Utah, nor the one who was Alexander’s son and who died before he was 30. This Earl was Alexander’s grandson, Earl Standish Douglass, who grew up fishing with his father, Leander, another well-known fisherman of 19th century Jefferson County. One of the benefits of having my website is that people looking for information on their ancestors might send me an email. Leland had contacted me years ago about his Fredenburg family tree. This time he had news that specifically connected his family and ours. That connection involved Earl Standish Douglass. Earl married at age 43, rather late in life even for those times, to a widowed lady, Mrs. Mary Fredenburg. I had done some early research in Chaumont and learned Mary had three children, Harry, Sarah, and Eunice. I assumed these were all Fredenburg children. Earl and Mary married in 1897, the same year that Earl moved his base of fishing from Chaumont to Sault Ste. Marie. I had been puzzled for years why, when I found Earl in Upper Michigan in the census, Mary was not with him. Nor did I find her anywhere else. I did find a grave for Mary Douglass in Chaumont. She died in 1917. Leland wrote to tell me Mary’s third child, Eunice, was a daughter of Mary and Earl. She was born in March 1898, six months after they married. We could build all kinds of hypotheses as to what happened, especially since Earl left for Sault Ste. Marie very soon after they married and never returned to Chaumont until after Mary died. 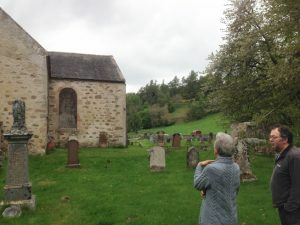 There are letters from Eunice in her old age to her Fredenburg relatives indicating that she knew a few of her Douglass relatives and that she at one time visited them in Chaumont. She did not mention ever meeting her father, Earl. Eunice married at 17 and had twelve children. Three of her sons served in World War II, one in the Army and two in the Marines. She was widowed in 1971 and she died in 1979. The year before she died, she wrote that she had nine living children and a granddaughter who was a senior in college. We are happy to have you in our family, Eunice Douglass Johnson. Lineage: Eunice-6, Earl Douglass-5, Leander Douglass-4, Alexander Douglass-3, John Douglass-2, Alexander Douglass-1. I have had George Cramer Teel in the back of my mind ever since the day I discovered him in the Iowa Soldiers Orphans Home in the 1900 census. It stated he was born in August 1887, was 13, attending school. The thing that struck me first was that he was in an orphanage with 790 other “inmates”. I wondered why because I thought his mother was alive at that time. A little research into the Home told me that it had started out as an orphanage for children orphaned by the Civil War and over the years it had grown to take in not only orphans but those so destitute their parents could not care for them. And in fact, the deprivation of George’s early childhood was born out in his physical frame I learned later. But it was many years before I could piece together even parts of his life. He was born in Iowa and eventually I found his mother and father in Palo Alto County, Iowa, records. His mother Eliza Cramer was born in Sauk County, Wisconsin, one of the 14 children of Samuel and Mary Ann (Douglass) Cramer. Eliza was the last to marry and leave home. Her husband was George Teel. George Teel was 25 years older than Eliza. He was born in Pennsylvania, moved to Wisconsin, married Ursula Craig, had four daughters born in Wisconsin and a son born in Cerro Gordo County, Iowa. He served in the Civil War, and did not surface in the records again until 1880 when he was living with a married daughter in Harper, Kansas. Harper, Kansas is where his wife divorced him for Gross Neglect in 1881. He had no occupation. One of his descendants reported that he was injured in the war and was totally deaf as a result. He could have suffered from what we now call PTSD. Regardless, he moved around a lot. He must have gone back to Wisconsin because he married Eliza in Sauk County, WI in 1883. He was 61 and she was 36. He brought her to Iowa and she bore him her only child, George Cramer Teel in 1887. In the 1895 Iowa State Census, Eliza Teel, 46, and her son George C., age 7, are living in Lake township, Clay County, Iowa. Her husband is not living with her. Some years later, as I continued to search for clues to what happened to young George, I “found” George C. Teel in the US Navy in the 1920 census: George C. Teel, 32, single, chief electrician, USS Aaron Ward, home address Sage, MT. I tried in vain to find any family connection in Montana for him. I could not find him in the 1930 census. Then again later, as more information became available online, I found a death record in Florida for a George C. Teel that had the right birthdate and birthplace. I sent for the death certificate. With relief I saw that this was the right George Teel, occupation Electricians Mate, US Navy, mother’s maiden name Cramer. He died in Bradenton. The person who gave information for the death certificate was Harry Stalker, who lived at the same address as that given for George. (Who was Harry Stalker?) Other significant information on the death certificate was that he was widowed and that he had been treated by Dr. Conrad in Bradenton since 1969. Had he come to Florida to live with a relative? What happened to his wife? Did he come to Florida in 1969 because his wife had died. He would have been 82 in 1969. I could make no family connections. He was an only child of his mother but his father had several children by his first marriage, but none of them married to a Stalker that I could find. Last February on a trip to Florida, I looked up George’s obituary in the Bradenton Herald. He died in 1974; he had come to Bradenton eight and a half years earlier from Palmdale, California. He was a member of the American Legion, the Retired Employees Club of Los Angeles Power & Light and a veteran of World War I and II. Survived by one sister, Mrs. Harry Stalker. A puzzle. Then I visited his gravesite in Bradenton. He is buried in the Veterans area of Mansion Memorial Park. His gravemarker says George C. Teel/ cem US Navy. The funeral director did not know what “cem” meant. (Chief Electricians Mate, I learned later) There was no wife buried with him which lent credence to my theory. I looked for a female Teel who died around 1967 in California and found Hattie Teel who died 3 August 1966, Los Angeles. It looked as if when George retired from the Navy, probably after putting in his 20 years, that he lived in Los Angeles. That was born out when I found the 1942 WWII draft registration for his cousin Edgar Crosby, who stated that the person who would always know his address was George Teel, Los Angeles. When I returned from Florida, the 1940 census was becoming available online for the first time. In 1940 George C. Teel, 52, married to Hattie, 51, worked full time for City Light & Power in San Diego. He had an 8th grade education; she had finished high school. They had a son, Douglas (!!) 11 years old, and living with them was his cousin Edgar Crosby, a construction worker, out of work. So finally I was beginning to get a picture of George’s life. His obituary had mentioned neither a wife nor a son. After years of wondering if he went through life without any family, if the Navy was the only family he had, I learned that he had contact with cousins and someone he considered a sister married to a Stalker. And he had been married and had a son. What happened to them? Since he had been a career Navy man, it was time to look at his Military Personnel records. I sent for them and waited weeks. Then they wrote me that because his records were in the Archives, it would cost me $70 to get copies of the file. Ouch! They would not sort the file for pertinent info for me – it was all or nothing at all. So I bit the bullet and sent the check. Next time I will tell you what I am able to filter out of the 100 plus pages of his file. If you read my book, Only a Week Away, you probably guessed that I am fascinated with stories about families who lived on the canal boats on the Erie Canal. Laura Jane Clemons, of Redfield, NY, married Wallace Gibbs, one of those canalers and she had several children. However, tracking those children is difficult; many canal boaters just did not get counted during census time. Because they were itinerant, they could be in any port along the canal, and they could be gone on the day the count was made of any particular boat basin. Jane and Wallace Gibbs’ family included Fannie, Edward, Orley, Alton and Clarissa. Clarissa lived to be 100 years old and died in 1985. She was the youngest child. But it is the oldest, Fannie, that has led me the longest chase. From old newspaper tidbits I had picked up that her married name was Fannie French, but for years, the name of her husband eluded me. Then this past summer, Keith Gerlach, the genealogist at the Utica Public Library, turned up a record in 1910 on Canal St. (how fitting) in Syracuse, NY. His name was Clark French, 46, married once, 19 years, to Fannie, 43. Her age tallied close enough. This must be them but I could not find him in any other census. Nor could I find when he died. I did find this item and a couple of follow-ups in the Palladium (Oswego, NY) newspaper and it shines a little light on where the canalers turned when they were in trouble. Nov 1888 – A man calling himself Clark French walked into the Sheriffs offices in Syracuse while looking for the Superintendent of the Poor. He asked for a physician. He was redirected and it was determined he had smallpox. An immediate fumigation of the sheriff’s office was conducted. The man was taken to the poor house. (Of the five the doctor treated in the Pest House, only one died. There were other deaths outside the Pest House) The Health Officer traced all of the contagion to Coppins Hotel, except for Clark French who came from Buffalo. They used quarantine to stop the spread. All of the furniture and bedding from the Pierce Hotel where French had stayed was removed and the room fuimgated. All hotel personnel and those who were known to have come in contact with him were vaccinated. It was not uncommon for there to be a few cases each year and deaths were not uncommon either. Vaccination was encouraged. Syracuse newspaper: In 1906, Clark French sued Will and Baumer Co. for differences in the bills of lading. Each party had a bill of lading but they did not agree. French thought he was entitled to more demurrage for his canal boat which had brought a load from Buffalo to Liverpool. I am sure this Clark French was Fannie’s husband, primarily because of the canal boat references. Fannie had come from a canaler’s family. Canalers were a loose knit group that kept to themselves, not always viewed positively by others in society. It was a rough life and they were a rough lot. Clark was in his 20s in 1888. Fannie did not marry until the late 1890s. In 1920 census Fannie is listed as “widowed”. She was supporting herself by making carpets. I know this is the right Fannie because she had her mother, Laura, living with her. Whether Fannie was actually widowed or just separated from her husband, I have found no more records for Clark French. But at least I have his name. Dr. Suess’ rhyme line comes to mind when I comtemplate the movements of the Douglass families in the late 1800s and early 1900s. As modes of transportation became more available, rail and motor car, and the country expanded its development of natural resources, jobs other than farming became available to the younger sons of large farm families. Typically, but not always, the oldest son joined his father on the farm while the younger sons left home to find a job that would support them and their own family. As the country expanded rapidly westward, good farm land was taken up quickly so people kept moving to find that job they needed. The oil fields of Oklahoma which were discovered in the 1920s drew young men from the east to work as roustabouts, pipefitters and laborers. The giant Seminole oil field was one of the largest historical oil fields ever found. Discovered in 1926, it contained an estimated 822,000,000 barrels of oil. Other important fields in Seminole County were the Cromwell field of the early 1920s and the Maud oil field. The Maud field, discovered in 1927 by Amerada Petroleum, was the first discovery using reflection seismology and marked the beginning of modern geophysical methods in the petroleum industry. No wonder the Santee brothers came from West Virginia to Oklahoma to make their fortune. It was hard work but it paid better than farming and one had opportunity for advancement. But I’m getting ahead of myself. Prior to learning from Gretchen about her great, great grandmother, Almira Cramer Colborn, I had done very little research in Oklahoma. I had researched in Kansas where some of the descendants of our Canadian Douglass families had moved from Kansas to Oklahoma cities. But one of Almira Colborn’s daughters, Lydia Jane Colborn, called Jennie, probably counted the number of moves in her life on the fingers of both hands and maybe her toes too. As I began to learn about Almira Cramer Colborn’s family of eight children, at first I did not find much for her daughter, Lydia Jane, probably because she went by Jennie. The only time I have found her listed as Lydia Jane was in her childhood. Even her marriage certificates say Jennie. (It was not uncommon for women named Jane to be called Jennie; I ran into that once before that caused me many hours of searching before I was sure I was studying the right woman) I had pieced a few things together for Jennie when I received an email from another genealogist, Diana, who said Lydia Jane was her great grandmother. And she filled in some info for me. I have great admiration for Lydia Jane Colborn. She was one tough cookie. She had to be in order to survive. And survive she did. There are pictures of her with her family, probably taken about 1915. She was a comely woman and looked pretty good for age 65. Lydia Jane “Jennie” Colborn was born in Oxford County, Ontario, Canada in 1851 and moved with her parents to Sauk County, WI before she was old enough to start school. Her father, William Colborn, enlisted in the Union Army in 1861 and died two years later having contracted a disease while in service. His widow, Almira, did not remarry. Jennie age 19, was not in Almira’s household in 1870, probably “working out”, household help for a neighboring family. Almira’s oldest son, Amos, also was in the Civil War, from 1862 until 1865. He would have been able to help the family once he was mustered out. In 1874 Jennie married George Palmer in Marinette, Wisconsin. George died three years later. When he died, Jennie was 7 months pregnant with baby Walter who was born Feb 1878. Little Walter died a week before his first birthday, at “Mr. Armstrong’s house” in Reedsburg, WI. Jennie’s older sister, Mary Armstrong died in May 1879, leaving three small children, and Jennie was probably helping to care for Mary and the James Armstrong family during that time which would explain why Walter died at the Armstrong home. At first I thought Jennie had married James Armstrong, not uncommon for men to marry their deceased wife’s sister, but the 1880 census shows James with three children and no housekeeper, so Jennie probably was helping but was not living in the household. In January 1882, Jennie married Noble Armstrong in Reedsburg. James Armstrong had remarried, so Jennie’s help was not needed there. Noble, probably related to James Armstrong, was living in Reedburg with a married brother in 1880. Noble and Jennie moved to Kansas soon after their marriage. Bessie Armstrong was born later that year and Jennie Armstrong was born in 1885. Things were looking good but, unfortunately, Noble, age 39, died in December 1885 in Barber County, Kansas. There is a marriage record showing that Jennie Armstrong married Terrel Parks in Barber County, Kansas in January 1888. A son, Lee Parks, was born in Kansas in May 1889. His twin sisters, Mary and Myra, were born in Oklahoma Territory in September 1891. That must have been some feat, to bear and nurture twins in a area struggling to create order out of the chaos following the Oklahoma Territory runs. There were several “runs”, those times when land seekers could run into the designated area and claim a portion of land for themselves. After the first run in April 1889, which land was free, land seekers had to pay for their claim as well as establish it by improving it. As the various Indian tribes were persuaded to accept allotments, the “unclaimed land” was opened to settlers in four additional “runs”, but it is likely that Terrel Parks participated in the initial run, since Kingfisher County where he died in 1893 was opened as part of the initial run of 1889. As a matter of fact, Terrell, Jennie and their three children are enumerated in the first OK Territorial Census, taken June 1890. Jennie would not have gone on that first run, being 8 months pregnant with their son, Lee. But since Terrel might have had to stay to defend his claim, she likely followed as soon as she was able. Many squabbles broke out over land claims and there was no legal way to settle disputes until, belatedly, Congress established the Territorial Government a year later in 1890. Diana says the story is that Terrel Parks died from falling into the well he was digging on his property in Kingfisher County, OK.
How Jennie survived from 1893 until 1899, with a family of five, including three very young children, is unknown. Did she stay on the property her husband had claimed? Not likely, but at this point I don’t know. She might have. In January 1899 Jennie married Richard Baker, a widower, with a six year old daughter, Lillie, in Garfield County, OK, the next county north of Kingfisher. But by 1910 they were separated and Jennie was living in the city of Lawton, OK, the county seat of Comanche County. What drew her there, I wonder. Lawton is a long ways from Garfield County or even from Kingfisher. Maybe that was the object. Maybe she had had enough of homesteading. Comanche County is where her daughter married Henry Russell and it was with this daughter that Jennie (Lydia Jane Colborn Palmer Armstrong Parks) was living when she died in 1936 in Muskogee, OK, at the age of 85. Lydia Jane Colborn sure had bad luck with her marriages. George Palmer m. 1874, d. 1877, Noble Armstrong m. 1882, d. 1885, Terrel Parks m. 1888, d. 1893, Richard Baker m. 1899 and in 1910 he says he is widowed (but he’s really divorced; Jennie took back the name of Parks) Each time one of her husbands died, he left her with very young children and in two cases she was pregnant when her husband died. Lydia Jane Colborn, born in Canada, moved to Sauk County, WI, to Marinette, WI, back to Sauk County, to Barber County, KS, to Kingfisher County, OK, to Garfield County, OK, to Comanche County, OK and died in Muskogee, OK. She certainly went further south than most of the Douglass descendants from Canada. She died 1500 miles from the place where she was born, not a great distance today, but she must have seemed a world away to her mother and her siblings, most of whom stayed in Wisconsin. Oh, yes, about the Santees. Hershel Santee, and his older brother, Daniel, came from West Virginia to work in the oil fields of Seminole County. Hershel married Myra Parks, one of Jennie’s twin daughters. In time this couple moved even further south – to Texas. No wonder the settlement of the west inspired so many romance stories and historical novels. Jennie Colborn’s life could make a great movie. Jennie’s lineage: (Lydia Jane/Jennie-5 , Almira Colborn-4 , Mary Ann Cramer-3 , John Douglass-2 , Alexander Douglass-1) To view the Cramer branch of the Douglass family, click here. Most people have heard of the Great Chicago Fire in October 1871 that destroyed a large part of that city. But most people have never heard of the Great Peshtigo Fire, which happened on the very same day. That there were two “great” fires was not a coincidence. It was the result of a nasty weather phenomenon, a cyclonic storm, that swept across the upper midwest. A fierce wind, high temperatures and very dry conditions created a maelstrom that swept over Peshtigo, surrounded as it was by forest, completely destroying the town, with much greater loss of life than in Chicago. Chicago lost around 250 people, but Peshtigo lost 1200 of its 2000 population. Chicago was a great industrial city, of course, and Peshtigo was unknown except to those who lived in the northern areas of Michigan and Wisconsin. Peshtigo, Wisconsin, is located practically on the border of Wisconsin and Upper Michigan on the Peshtigo River, which empties into Green Bay. A large area on both sides of Green Bay, the arm of Lake Michigan that reaches into Wisconsin, were burned; some reports say a swath 10 miles wide and 40 miles long. Several other towns in the path of the fire, Menominee, MI, for example, had many buildings burned, but no loss of life. Peshtigo was directly in the path of the fire and nothing could have saved it from its fury. Small settlements to the west of Peshtigo were completely obliterated and never heard from again. You can read a first hand account by a minister who survived the Peshtigo fire at wisconsinhistory.org. It is hard to even comprehend how there were any survivors. They went into the river, of course, but they had to stay there for hours, and keep their heads showered with water, or covered with wet clothes, the heat was so intense. Then there was the risk of hypothermia, and many could not stay above water. Those that survived were dazed, half blind from the smoke and heat, and it was days before help began to trickle into the town. When word arrived at the Wisconsin Governors’ mansion, two days later, Gov. Fairchild was away in Chicago assessing damage and offering assistance there. His wife, however, sprang into action, and in a short while, sent carloads of supplies to the survivors in Peshtigo. The Governor diverted some of the aid for Chicago to Peshtigo to help rebuild the town. He also sent an appeal in the newspapers across the country for donations to a fund to help the burned area. Then, as now, people gave generously in the face of disaster. I “discovered” the Great Peshtigo Fire when I was researching the family of Almira Cramer Colborn. I had looked for years for additional children of Mary Ann (Douglass) and Samuel Cramer who settled in Merrimac, Wisconsin. I knew of only seven children but Mary Ann’s obituary in 1885 said that she had born 14 children and nine were still living when she died. A few months ago I received an email from Gretchen, a great great granddaughter of Mary Ann Douglass Cramer. Gretchen had what I had been searching for: a death certificate that stated Almira Colborn was the daughter of Sam and Mary Cramer. She sent me a large descendants tree (well over 150) for Almira and William Colborn which I have added to that family branch and have spent many hours fleshing out information about Almira’s descendants. Almira Cramer, oldest of Sam and Mary Ann’s children, born 1825, married William Colborn in 1842 in Blenheim, Oxford County, Ontario. Most likely they moved to Sauk County, Wisconsin, when her parents, Sam and Mary Ann Cramer did, between 1852 and 1856. Five of Almira’s children were born in Canada, the youngest in 1852; then the sixth child was born in Sauk County, WI, in Jan. 1856. William Colborn, Almira’s husband, died of disease during the Civil War in 1863. Almira did not remarry. Her oldest daughter, Melissa, married Samuel Clark in 1861. At the time of the Great Fire in 1871, Melissa (Colborn) and Samuel Clark and their three children lived in Menominee, Michigan, which suffered loss of many buildings but no loss of life and certainly not the extreme loss of Peshtigo. Peshtigo, Wisconsin, is a neighboring town only a few miles to the south of Menominee, Michigan, with the Michigan-Wisconsin state border running between them. Stories of the Great Fire of Peshtigo and Menominee must always have remained a part of their lives. Even if the children were too young to understand it all when it happened, they would have heard the stories retold throughout their lifetimes. Sam Clark was a carpenter by trade and certainly would have had work in rebuilding the burned out areas. I do not find Sam Clark in the 1880 census but he was still living in 1900, listed with his married daughter. Melissa Clark died in 1877 and her two children, Grace and Frank, are living in 1880 with their grandmother, Almira Colborn, in Sauk County, WI. Subsequent records show that both grandchildren moved back to the area where they were born. Grace married Frank Salzeider. They farmed in Menominee County. Frank Clark married and farmed in Norway, Dickinson County, MI, to the NW of Menominee. Marinette County, Wisconsin, which includes Peshtigo, is a large county. Several of Melissa’s siblings married in Marinette County: Amos Colborn married there two years after the fire; Lydia Colborn and George Palmer married there in 1874: Alexander Colborn married Martha Washburn there in 1879. Perhaps the lumber industry which was the core of Peshtigo’s economy, drew them there for work. Their mother, Almira Colborn, widowed, is shown in Sauk County, WI, in both the 1870 and 1880 census, but there is a possibility that after her husband died, she lived in Marinette County, nearer to her married daughter, Melissa, and that her younger children grew up there. That would account for so many of them marrying there. She could have moved back to Sauk county before 1880 when she was caring for Melissa’s children. This is all supposition on my part, but Merrimac, Sauk County, WI is 180 miles from Peshtigo, WI, so I am assuming that the Colborn children were living in Marinette County, at least at some time, since that is where several of them married. The wholesale destruction of Peshtigo and surrounding area is akin to the huge natural disasters of our time. The scars, physical and emotional, remaining with the survivors, can not but have changed them as people, and affected their lives in a multitude of ways. Agnes Douglass died in Minneapolis. I could not find an obituary for her. Her death certificate said she was buried in Menno, South Dakota, but that her usual residence had been Mankato, MN. I stopped in Mankato at the library to see if I could figure out how long she had lived there. It appears that she lived there only a couple years and probably moved from Mankato to the Care Home in Minneapolis only a few months before she died. Where she lived between Platteville and Mankato is still unknown. I hoped that Menno would have an obituary. I had little hope of looking at death records. The state of South Dakota has some very strict laws about giving out vital information. It costs $15 per name just to have them look in their books for a record, whether they find one or not, and if they do and you want a copy, it costs another $15! So different from all the other places I had been. But I had to ask. I first stopped in Elk Point, SD, where Chester Douglass had established a drug store that later was run by Gerald Douglass, his cousin, and later still by Edward Swanton, husband of Gerald’s sister, Minnie. The Douglass drugstore occupied a place of prominence on a corner in the center of town. Today the building houses an insurance agency. The village has changed so little it is not hard to imagine what it looked like when the drugstore was in business. The Douglass drugstore is an integral part of the history of the town. Across the street from the original site is a small soda fountain and gift shop that has the name Douglass Drugstore on it. The owner had moved a large old marble soda fountain counter from another town to her store and serves ice cream, capitalizing off the Douglass name. I talked with her at length. Elk Point had recently had it’s sesquicentennial celebration and she showed me some books they had printed up for the event. One book had pictures of all the high school graduating classes. I found pictures of Gerald’s daughter, Carolyn, class of 1923 and Carolyn’s daughter Julie, class of 1964. A calendar with photos showing the town as it looked in the late 1880s noted that Chester Douglass and two partners formed the Pioneer Drug Co. in March 1904. I went on to Hutchinson county seat, Olivet, where the clerk reiterated what I already knew: she could not give me any information. But she suggested, almost in a conspiratorial aside, that I walk down the street one block to a museum and talk to the woman there. The woman had lived in Olivet all her life and had many records and knew lots of local history. The lady at the museum house was very helpful. Though she did not have old newspapers that might have held an obituary for Agnes, she called the library in Menno for me. They did not have the newspapers either. But when I inquired about the cemetery in Menno, she pulled out the cemetery record book and Caroline Douglass was listed! She even had an old map of the Menno cemetery and was able to show me where the graves were. She was truly a fund of information. I hurried back to Menno again about 4:30, hoping that the city hall office was still open. When I found it, I asked where the cemetery was, got a quick answer and headed out there. It was a small cemetery on the edge of town. Not far from the entrance was a Douglass monument inscribed Wesley Douglass and under that Caroline His Wife/Dec. 12, 1847-Sept 11, 1930. So, finally, the question of when Agnes Douglass’ mother, Caroline, died and where she was buried, is answered. To the left of the monument was a stone for Agnes Douglass and to the right stones for Agnes’ brother, Gerald, the Elk Point pharmacist, and his wife, Annette. Marjorie Douglass Detlie, Gerald’s daughter, said there had been a fracture in the relationship between Agnes and Gerald over medical treatment for their mother. Whatever the difficulty, they were all gathered together at the end of their lives in the prairie town where Wesley Douglass, youngest of Robert and Jane’s sons, had carved out a place for himself and his family back in 1874. The next day, I visited the huge state archives in Pierre, SD, and while they had many old newspapers on microfilm, they were missing the issues that might have included obituaries for Agnes and Caroline. It seems we will never know if there was one or not. But my time in South Dakota was most satisfactory, considering the constraints upon my research there. One of the biggest treats I gave myself on my long trip was visiting Dinosaur National Monument in Jensen, Utah. Before I went there I stopped in Salt Lake City at the University of Utah to look at their Special Collection of Earl Douglass’ papers. I would have been more disappointed to find only the photos were available (his papers were stored in another location) if I had not received a remarkable communication only days earlier on my trip. Earl Douglass’ granddaughter, Diane, wrote me an email of the centennial celebration she had just attended at Dinosaur National Monument honoring Earl’s discovery of the mammoth dinosaur fossils. Earl’s son, Gawin, had been writing a book about his father’s discovery, which had been edited and now published by his granddaughter! She said the book contained many pictures and that it was available on Amazon.com. I was thrilled to know about the book. I had not realized that August 1909 was when Earl made his great discovery so was unaware of the anniversary date. But I was so pleased on stepping off the elevator at the U. of Utah to see large photo displays of Earl at his discovery site, along with a glass case containing samples of his diaries and his poems. Yes, another poet. His poems are written much in the same style as Dr. John Douglass’ are. This simply whetted my anticipation for reading the book. The Dinosaur National Monument Visitor’s Center also had evocative displays of the work Earl Douglass had done there. I walked to the top of the hill overlooking the area that had been mined for the great bones. Such a rugged area, it is hard to comprehend the tremendous effort it took to dig out the huge fossils and transport them to Pittsburgh or Salt Lake City. I felt like I was treading on hallowed ground. At the store I wanted post cards with Earl’s picture on them but found none. However, they had the book. I couldn’t wait to read it. Created in large part from Earl’s diaries and the memories of his son, Gawin, it is a wonderful testimony to the passion that stayed with Earl all his life. Look for it: “Speak to the Earth and It Will Teach You: The Life and Times of Earl Douglass (1862- 1931)” by G.E. Douglass, and edited by Diane Douglass Iverson. It’s fascinating. A few months back I wrote about breakthroughs in finding what happened to Earl’s sister, Ida. (There are pictures of Ida, as well as Earl’s whole family in Diane’s book.) Shortly before I left on my trip in August, I found a death date for Ida’s only daughter, Viola Battin Gates, in Tulare County, California. Tulare was off my travel itinerary quite a ways so I wrote to the Genealogical Society there and asked them to look up records for me. I was unprepared for what I received. According to the newspaper account, Viola had been staying with her daughter, Dorothy, in Terra Bella. Evidently she had been despondent for some time. She committed suicide in 1954 by jumping off the bridge into the Friant-Kern canal. Her obituary mentioned that her husband, William Gates, had died in 1950. The Sequoia Genealogical Society had looked up his obituary and sent that too. He died as a result of an auto accident, the day after Christmas, when they were leaving Terra Bella after visiting Dorothy’s family. His 24 year old son, Harold, had been driving; other members of the family survived. Such a sad, sad story. Montana was persuaded to give up one of its secrets, too, this time related to James Heber Douglass. James Heber was the oldest son of William and Polly Douglass. (You may recall me telling you of William, a farmer in Port Elgin, Ontario, who suffered a paralyzing stroke) James Heber, whether he had the option or not, chose to leave the farm. He and his wife, Minnie, emigrated to Chicago in 1889, the same year they married. Wilfred wrote in his “Canadian Genealogy” in 1926 that Minnie had died and James was at that time living in Butte, MT. No further mention of a funeral was found in the paper through June 7. I am assuming that the body was forwarded elsewhere for burial. Chicago? Or perhaps wherever Minnie is buried? At least now we know when and where he died. He was truly a long way from any members of his family when his life ended. Evidently I was not done with the McKeeby family yet. I received in the mail copies of articles from the Knoxville, TN newspapers which gave substantial information about Byron G. McKeeby and also pictures of him and some of his prints. Prior to receiving these copies, I knew that Byron was a printmaker of some renown at the Univ. of Tennessee. Also Cecil Douglass had reported in a 1977 letter, that Byron had been to Scotland, thought Edinburgh a beautiful city, and did not understand why his grandfather had not held a plaid instead of a pitchfork when he posed for Grant Woods’ “American Gothic”. Byron’s dry wit and the wry humor is reflected in many of his prints. His student, Paul Wenzel, said that Byron always wore a Scottish Tam-o-shanter hat, with a fuzzy knob on top and ribbons down the back. Even after he used the hat to beat out a fire someplace and it was singed and darkened, he continued to wear it; he did not care what others thought. He had such presence he could carry it off without drawing ridicule; no student would ever, EVER snicker at him. As is often the case with some oddity, the hat became legendary from another story students told. Byron would toss his hat over “No Smoking” signs before he lit up. Though early-onset acute diabetes shortened his life, Byron made a name for himself and his art in his 22 year career. One article noted that he single-handedly did much to revive the art of stone lithography. Soon after his death UT made an exhibit of more than 50 of his prints available for display at venues across the country. I was so inspired by my field trip to Allen County Library that I began thinking of all the other places I would like to go to look at records. If I made field trips every few months I could visit different places each time. OR I could make one long field trip and visit many places on the same trip. The latter idea grew and gradually I began to put together an itinerary. On August 5th I set out in my trusty Chrysler van, intent on camping my way across the U.S. so I might look up all those elusive bits of information I wanted. One of the first places I stopped was in Lee County, Illinois. I knew that the MacKinnons (Catharine Harrison branch) from Canada had lived all their lives in Lee county, where John MacKinnon had been a cheesemaker. I had not been able to find obituaries or death notices for them. In the Dixon, Illinois, library I found a front page article in the local newspaper. John MacKinnon had dropped dead of a heart attack while fighting a fire at the local hotel. See excerpts from this news piece at headliner. Then I went on to Wisconsin to follow several elusive clues for Giles Douglass and his son Robert. Looking for Giles in Wisconsin has been like trying to track down a specter or a ghost, a will-o-the-wisp or one of the “little people”. I get a clue that there just might be something but when I look, it’s not there, or it only hints of what I hoped for. Checking county records in Janesville, West Bend, Wisconsin Rapids, Black River Falls and Sparta netted nothing that even was close to info on Giles or Robert. There are several Robert Douglasses but none fit the info I have for him and nothing at all for Giles. Many records were not instituted until after the time span I need which means very little will be in the public records. If there is anything anywhere, it is going to be informal, in someone’s diary or letter or church newsletter or such. I have to keep reminding myself that untold numbers of people lived and died upon this earth leaving no scrap of written record. Giles Douglas remains the only one of the nine siblings that I have been unable to trace at all. Next stop: the archives in Albany to see what they have from Jefferson County before 1848, when Giles left for Wisconsin. One of the places I really wanted to visit was Platteville, WI, where Agnes Jean Douglass had taught Art in the college there. I arrived in Platteville on a Saturday evening and was disappointed that the library was not open on Sunday. I did a lot of reading Sunday and walked around the small town and found a large map of the Platteville/UW campus. I was able to plot out where the administration building was and where I could park. The campus was deserted except for other walkers. Monday morning was rainy. I first stopped at the Alumni office and they were very helpful, going through old college yearbooks to determine when Agnes had taught there. They copied several pictures for me and referred me to the Luce Room archives which were in the same building. Just as I was leaving the Alumni office the fire alarm in the building went off so we all had to exit, of course, and it was raining steadily right then. Since I had an umbrella, I offered to shield Lois, the woman who had been so helpful to me, and we stood really close together under my small umbrella for at least 15 minutes. Finally the all clear sounded and we parted company. In the Luce Room they had copies of the student newspaper, which had been indexed, and I found a few more references to Agnes. I was unable to determine whether she retired or left due to ill health. She evidently taught there in 1947 but the college directory for 1948 has her listed as on faculty but “on leave”. Her classes had been taken over by someone else. I searched in vain for any retirement notice in the newspaper and when I wanted to look at city directories to see how long she continued to live there, they had no directories that went back that far. And I found no clue about when her mother died. I knew her mother, age 82, had been living with Agnes in 1930 in Platteville. Marjorie Douglass Detlie thought her grandmother was buried in Worthington, MN, but I had been unable to find a date when Caroline Church Douglass (Wesley’s wife) died. It would have been extremely time consuming to read local newspapers on microfilm, with just no idea at all of when she died. So I left Platteville with one question answered. Agnes Douglass taught Art at the Platteville college from 1926 -1947. She was the only Art teacher and had a full complement of classes. She arranged for art exhibits to be displayed at the college. She also participated in conferences where she presented on the topic of Art Occupations. She spoke to community groups. More notes on Photo page. (Lineage: Agnes-5, Wesley-4, Robert-3, John-2, Alexander-1) – another artist from the Robert Douglass branch of the family. I spent a couple days at the Allen County Public Library in Fort Wayne, IN, last week. I have wanted to get there for a while and decided it would make for a nice two or three day excursion. Besides all it was doing here in Covington was raining and I could not work on the garden or lawn anyway. As always I went with a list in hand; there is always so much information, one gets side-tracked very easily. I had been wondering about the McKeeby’s and trying to finish up my data for them. I needed Byron J. McKeeby’s mother’s name. I had found the family in the 1920 census, but by that time Byron’s mother had died. I could not find them in the 1910 census. I knew that Byron J. McKeeby who married Miriam “Mimi” Douglass had lived in Cedar Rapids in 1920. His father Byron H. McKeeby was a dentist there. (In fact Byron H. has some notoriety having posed for Grant Wood’s popular painting, “American Gothic”) So I looked at Directories for Cedar Rapids on microfilm and was able to establish that Byron H. McKeeby was indeed a dentist in Cedar Rapids inclusive of years 1903-1912 and his wife’s name was Belle. So back to the 1910 census. I finally found them. The census taker had been distracted, or else Byron H. used a nickname, because on the census it says McKeeby, M.C. and then goes on to list Belle, Gerald, 11, and Byron, 8. Interestingly, in years 1904-06, Byron H. is listed as dentist and druggist. Dentists had long been sources for potions and pain killers but I did not realize that practice reached into the early 1900s. He had an office at 1508 1st ave. Cedar Rapids, IA. They bought the Blake avenue house about 1911. So now I had his mother’s first name, but I could not find any marriage record. Then I started looking in the large collection of books and found one titled “Linn County and Cedar Rapids, Iowa Records.” And there, practically the first item in the book, is a listing of all the names from a McKeeby Bible record giving the births, deaths and marriage of Byron H. McKeeby and Belle Metcalf. The Bible that supplied the records was in the possession of Gerald R. McKeeby, Byron J.’s brother. The next item on the list was what happened to Fernando Douglass’ daughter, Ida? You may remember Fernando; he was one of the first pioneers to settle in Medford, Steele County, Minnesota, and wrote back exultingly to his parents that he was growing wheat and getting top dollar for it. (In my book, Only a Week Away, you will find the story of his losing his mill in Greenboro, Oswego County, NY, after which he departed for MN) I wrote in my February 2007 Digest about Fernando’s son, Earl, who gained prominence for his discovery of dinosaur skeletons. And I knew that Fernando’s middle daughter, Nettie, never married and was living with Earl in Utah when she died. Ida was the third and oldest sibling and in 1885, at age 27, she was living with her parents in Medford. I had checked and re-checked the 1910 and 1920 census on Ancestry, online, for an Ida of her age who might have married and had a different surname but could not find anyone that seemed to fit. So I decided to try the 1895 MN State census. The 1885 and 1895 State censuses are valuable because the 1890 federal census was almost completely destroyed by fire so that means tracking by census leaves a big gap between the census of 1880 and the census of 1900. The states usually held their censuses between the federal census years, and if it was a territory being settled, census was taken even more often. I carefully scrolled the 1895 census, Town of Medford, and there were only two Ida’s in the whole town, one a child, and one listed as Ida D. Battin, 37, wife of Alfred Battin, with children, Greta, 17, Jay, 10, and Viola, 5. Aha! I liked the middle initial D.; it could stand for Douglass. She could not be the mother of Greta and probably not Jay, but she could have married Alfred as a second wife and Viola was hers. Alfred reported he had lived in the state of MN for 42 years but in the local enumeration district only 4 years, 6 months. I found him in the 1880 census with 1st wife, Mary, in Sibley county, MN. So with this framework of names and dates, I checked with Rootsweb Family Trees and was amazed to find the Brasfield-Brassfield Genealogies tree with all the information I had just teased out of the census for the Battin-Douglass family and more besides. Someone has spent a good deal of time and effort putting this information together. The genealogist had Ida’s death date (1910) and the fact that she is buried in Union cemetery, Medford. Also Viola’s marriage to William Cecil Gates in 1917. I had suspected Ida died before her father, Fernando. Otherwise he would have likely lived with her instead of going, in his eighties, to Massachusetts to live with his brother Orlando’s widow. But now I know she had a daughter and even have the daughter’s married name. Fernando had only a couple grandchildren and I am still trying to find any great grandchildren. The Brassfield tree says Viola had two children but I need to find documentation of her marriage to Gates. I might have found Ida in the Rootsweb Family Trees if I had looked for her there. I undoubtedly did look at some time in the past but I forget that more names are being added to that database all the time and I need to check it out again every few months or so. Anyway I was pleased with my time at the ACPL and there is plenty of info there when I have the inclination to go back. I left there to visit the graves of Cy and Isobel (“Issy”) Douglass Parker (sister to Mimi Douglass McKeeby) in LaPorte, Indiana. I spent the night at a campsite and had breakfast in downtown LaPorte at Louie’s Cafe. I love to have breakfast where the “locals” do. They know all the best places. I had a good chat with my waitress, spent an hour at the cemetery searching for the graves, taking pictures and talking to cemetery staff and then headed south to the Crown Hill cemetery in Indianapolis. When I was planning my trip to the Allen County Library, I was dismayed to learn that both David and Rosemary Parker Laycock had died last year. I had talked with Rosemary on the phone years ago and she sent me some information for their family tree, but I never did meet her. David and Rosemary’s urns are stored in a beautiful mausoleum in the Crown Hill cemetery. I have seen mausoleums before and they never appealed to me much, but this open construction and adjoining garden gave me a great feeling of airiness and beauty and peace. You can find the Laycock pictures and obituaries in the Photo Gallery. This title is a reference to the difficulty I have had this past couple months trying to document the family of George A. French. Not since the early days of my research have I had such a problem, trying to sort out men who have the same name and nearly the same birthdate, and determine which one might be the REAL son of Gideon French. Gideon French was born in 1856 in Oxford County, Ontario, grandson of Betsy Douglass Flewelling. Gideon left few traces and it was years before I discovered he did not die in his youth. I found a marriage record for Gideon and Altha Leech. After many census searches, I found them in the 1880 census in Midland, Michigan, and they had a two year old son, George A. French. I have not found Gideon and Altha in any other federal census, in the U.S. or in Canada. So I tried to follow their son George. Perhaps his census records would give me a clue as to what happened to Gideon. In the 1900 census, there was a George A. French, b. Dec. 1878, 21, boarding in a home in Detroit, MI. That seemed reasonable, to have moved as a young man from Midland to Detroit. But I needed proof. So I checked for a birth registration and found a George A. French, born in Oxford County, Ontario Dec. 3, 1878 to Gideon French and Altha Leach. Right! This must be Gideon’s son in Detroit in 1900. So far, so good. But when I tried to follow George A. French, born 1878 in subsequent census records, I became very confused. There were at least two, maybe three, George Frenchs born in 1878, two even on the same date! One of them lived and died in Louisville, Kentucky. (When I first found this record in the census, I thought, hey, maybe I have a Douglass descendent living in KY where I live.) But it seemed like they had different wives in every census and different occupations. George #1, to denote the one who I have a birth registration for, lived in Detroit for 30 some years, had a wife, Mary, who was born in Scotland and a daughter Brenta May. George #2, also born in Canada, lived in Kentucky as of 1920, with wife, Martha, and step-son, Fred, both born in KY. His WWI draft registration has the exact same date of birth, Dec. 3, 1878. Only his death certificate says his father is Arthur! George #3, on his WWI draft registration, was living in Cadillac, MI, but his birthdate was Jan. 21, 1877, and born in the U.S., not our man, but with a birthdate close enough to crop up on census searches and keep confusing the issue. These records did not come all neatly composed as I have offered them to you, but with each new record I unearthed, I would have to analyze again and puzzle over which one referred to my George French. To confuse things even further, I finally found a marriage registration for George #1 (listing his parents Gidd French and Altha Leitch) to Barbara McMahon. None of my three Georges have a wife Barbara. And in the marriage registration, 1902, George #1 has occupation: underwriter but in the next three census reports he is a carpenter. George #2 is also an underwriter and then a draftsman for an oil refinery. I finally think I have them sorted out but need some more documentation to be sure. Some of the information or clues that I got came from Family Trees on the internet. One has to be careful in taking that information as accurate if there is no citing of sources attached. Many people enjoy the search for family connections and will copy any family trees from the internet which seem to have some of the same people as theirs, but without doing any of their own checking for sources. One does not know where the information came from. It could simply have been copied from some other website or family tree. I have found errors in family trees on the internet, errors I can identify because I have documented a source. Part of my time now is spent searching for documentation, so that others can know where I got my information. I currently have 4104 individuals on my Douglass database. Of those I have birthdates for 3152. All but 250 birthdates are documented. Some are very difficult because in the beginning of my genealogy research I was not aware of the importance of documenting and did not always record where I got the date. But little by little I am getting them documented. Ready? Here we go again. In searching for Gideon, I never found him, as I wrote above, in a federal census after 1880. But, surprise, surprise, I found him in a Kansas State census in 1885. Gideon, Altha, George, age 6, and sister, Nella, 2. This immediately throws all of my neat analyzing into the hat again. Is the George in 1900 Detroit really George #1? Or could it be George #2? Being a little tired of the quandary at this point, I concentrated on Nella. Until this record I did not even know George had a sister. I found a marriage registration for Nellie French (parents Gidian and Altha) to Frederick Sidle in Blenheim, Kent County, Ontario, July 4, 1899. So at some point Gideon, or at least his daughter, returned to Canada from Kansas. Whereas French has pretty straightforward spelling and only becomes a problem if one is doing a general internet search, not just a family tree search, (in which case “French” pulls every reference to that word) “Sidle” has other problems. I could not believe how many different spellings one could find in the census for this family name. But I did find Fred and Nellie in the 1910 and 1920 census records in Presque Isle, Michigan. All eight of their children were born in MI, so they must have been there from 1900 on. But they are not in 1930 census, at least I cannot find them anywhere. I have checked out Seidl, Siddle, Seidel, and several other spellings but I really had to throw up my hands when I found them in the 1920 census listed as Fred and Nellie Saddle! In this case I am grateful to the Ancestry search engine which makes allowances for crazy spellings. Sometimes the only way I can finally get documentation is to pay for it. Even that does not always work. I sent to Montana for a death certificate for Nina Flewelling. Nina lived to be nearly 80. Her husband and only daughter predeceased her, so information was given for her death certificate by her grandson and he did not know Nina’s parents’ names. This is the same family as above: Flewelling. Nina’s husband, John Flewelling, was Gideon French’s uncle. If you look at the genealogy chart for Betsy Douglass Flewelling, you find Gideon’s family at the top of the page, and if you scroll all the way to the bottom, there you will see John Flewelling, Betsy’s youngest son. The Flewelling researchers in Canada have “assigned” John Flewelling to Betsy, but at this point there is no proof he is her son. At age 19, he was still in Canada, but in 1881, he married Nina Gilbert in Pine Run, Genesee County, Michigan. It was no surprise that he was in Michigan; several of his siblings had homesteaded there, but I was still wondering about his parentage. If John was born in 1852, Betsy would have been 46 when he was born, not impossible for that era, but reason for caution. I tried to access John’s marriage record in Michigan when I was there several years ago. There was a Flewelling/Gilbert marriage in the index, but when I looked for the record, it has been indexed wrong. No such marriage on the indicated page, nor in the indicated book! So I could not prove he was Betsy’s son. John eventually went west and owned a silver and lead mine. I am sending for a death certificate for a John Flewelling who died 1935 in Sandpoint, Idaho and hope this settles the issue of parentage. His wife would have still been alive then and she should have known his parents’ names for his death certificate. One hopes anyway.